In order for recommendation and matching systems to take a big leap forward, we need to explore an entirely new path in artificial intelligence that moves beyond traditional neural networks. Nara Logics is pioneering new territory by creating the first neuroscience-based synaptic intelligence platform for customer recommendations and employee decision support. 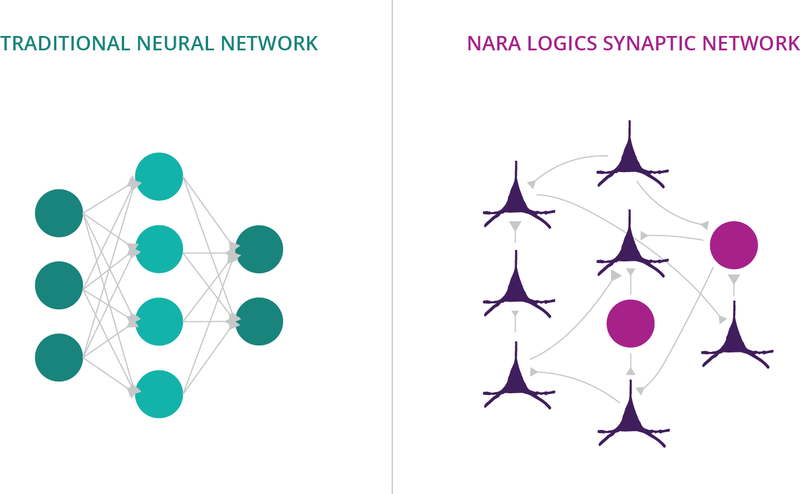 Unlike earlier neural network implementations that abstract around the complexity of true synaptic learning rules, Nara Logics is not “inspired” by a cognitive abstraction of what brains do. Rather, we are focused on the actual mathematical logic of how brain circuits compute, leveraging recent work to elucidate these mechanics that post-dates traditional neural networks. The key benefit to this biologically-inspired approach is that each and every recommendation has explicit connections in the network that aren’t “blown up” every time a network is trained — which is how most even the most cutting-edge machine learning systems work today. Instead, Nara Logics’ synaptic intelligence algorithm is continually learning and getting smarter as new information is added.